This is a guest post written by the author Mary Hamer. Mary is a university professor and the author of several academic texts. 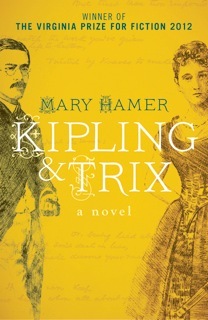 Her first novel, Kipling & Trix, was published in October 2012 by Aurora Metro and tells the story of the life of Rudyard Kipling’s sister Trix. Here she writes about why Trix’s story continues to fascinate us, and why she chose to write about her. Who knew that he even had a sister, Rudyard Kipling, the man with the moustache and pebble glasses, the one who wrote The Jungle Book? Trix Kipling’s work also achieved fame—but only when she wrote under a false name. My novel Kipling & Trix brings their stories together for the first time. When I began to pay attention to Trix, I found that the story of her life was more gripping than any fiction she managed to publish. I set out meaning to write a novel about her brother, Rudyard, starting with the traumatic scenes of his childhood. I soon recognised, though, that the impact on his little sister would have been even more damaging. I’ll say more about what happened to them in a moment. Instead of tracing Rudyard’s struggle to overcome this early experience, a struggle which was successful in many ways, for he became the most widely read writer in the English language, I found myself playing with the contrast between his life and what happened to Trix. She grew up in a family of writers who supported and encouraged her. When they were both still in their teens she published a set of parodies jointly with her brother. The whole family collaborated on the Christmas number for the English language newspaper out in Lahore, the Civil and Military Gazette. (Lovely name!) That number included a short story written by Trix. When she published her first novel, at twenty-two, her career as a writer seemed to be taking off. Titled The Heart of a Maid, it was surprisingly daring, describing the feelings of an engaged girl who shrinks from physical intimacy. Reading the marriage service gave her new cause for fear and hesitation, Trix writes. It told of duties from which she shrank . These words have the ring of emotional truth but they left Trix and her own feelings dangerously exposed. She herself had only been married a year. Marrying Major Jack Fleming on her twenty-first birthday—which sounds as though her family didn’t like it and had asked her to wait— opened a long period of progressive desperation and decline. As an army wife out in Calcutta, she was isolated, separated too from her literary family. Now the damage she had suffered as a small child really began to kick in. She couldn’t grow past it. The Kipling pair weren’t the only young children sent back to England for the sake of their health and their education but the experience of little Ruddy and Trix was exceptional in crucial respects. When Trix was three and a half and her brother was rising six, they were left without explanation, by their parents. Bad enough, you’d think. Then their foster-mother, Mrs. Holloway, turned out to be a disastrous choice, using threats of Hell fire to subdue the children and break their spirit. She also attempted to separate them. Attacking the little boy at every opportunity, she tried to diminish him in his sister’s eyes while she smothered Trix in a cloying affection. The children never complained to their parents at the time. Perhaps even more surprisingly, once they’d grown up, Rudyard and Trix never told them what a mistake leaving them with Mrs. Holloway had been or how much they had suffered. So we can sort of see why Trix might have had problems, both with intimacy and with finding her voice. Those vulnerabilities played out in her life as an adult in ways that are fascinating. Remembering them allows us to make emotional sense of her development as a woman and as a writer. Trix didn’t appear to flourish, married to Jack. Her writing stalled. A second novel, entitled A Pinchbeck Goddess spun an odd and unconvincing tale of a woman who because of her past has chosen to live in disguise. I can’t help wondering whether Trix was unconsciously admitting that she dared not reveal herself further, or open up as a writer. She did publish some rather derivative short stories in English magazines but she never managed to write a third novel. Instead Trix comforted herself by experimenting with ‘automatic writing’. This activity was associated with spiritualism, at the time a form of serious scientific enquiry. If radio waves could carry through the ether, people thought perhaps spirit messages, voices of the dead, might do the same. Trix would sit at her desk, pencil in hand, notebook at the ready, and wait. Her hand, she reported to friends, would start moving of its own volition, scribbling over the page. Today it seems likely, if not obvious, that what she wrote came from inside herself, not from outside. But when Trix sent copies of these messages back to the Society for Psychical Research in London, they were taken extremely seriously. Her ‘spirit-writings’ were collected as part of a group experiment, known as the ‘cross-correspondences’. Under the pseudonym of ‘Mrs. Holland’ she became celebrated. Reading those messages, however, what strikes a modern reader are their cries of loneliness and longing, the voice of the child in Trix, perhaps, suppressed but refusing to be silenced. Rudyard warned his sister to keep clear of spirit writing, well aware that it had been known to cause breakdowns. But it was too important to her. She persisted. And duly broke down, in 1898 and again for a long period starting in 1911, when her mother died. Yet her story doesn’t end on that note. After years living apart, Trix came home to her husband and to a handsome house in Edinburgh. It’s a hotel these days and I’ve slept there myself. She remade her life, a popular figure, always beautifully dressed and full of fun. Perhaps rather too talkative. Kipling & Trix ends with her visiting the Edinburgh Zoo, followed by a little crowd of admirers as she makes her way from cage to cage, talking to the animals in the Hindustani she spoke so fluently as a child. Published by Aurora Metro in October 2012. I reviewed the novel here. I’m so proud of the little Best of 2012 series I’ve put together on the blog over the past month or so – some of my favourite bloggers and writers were kind enough to contribute, and I’ve had great feedback on Twitter from bloggers, writers, readers, and publishers. A huge thank you to everyone who contributed their amazing pieces – I really appreciate it. We celebrated a great year in books. As a nice little New Year’s Eve post I thought I’d do a summary of the series and link to all the posts from here. Happy reading! 2013 is set to be another amazing year for books, despite the closure of some book shops and a decline in the sales of print books. I for one am sticking with print and my fingers are crossed a few more book shops will start reappearing on the high street soon. The written word is a cornerstone of our civilisation and we cannot let it fade away. This post has been kindly written by blogger Sarah Chapman, who also happens to be part of the amazing Mslexia team. Sarah’s blog The Bibliomouse is always a joy to read and I love her frank and witty reviews. She was an obvious choice to include in this series. Here she talks about her pick for 2012, Tell The Wolves I’m Home by Carol Rifka Brunt. When Lizzi asked me to write about my favourite book of 2012, I blithely agreed, forgetting both how indecisive I am and how many fantastic books I’ve read this year. From the multi-layered and atmospheric Tigers in Red Weather by Liza Klaussmann to the tightly plotted and downright tricksy Gone Girl by Gillian Flynn, from the magical The Snow Child by Eowyn Ivey to the tense Heart-Shaped Bruise by Tanya Byrne and the brilliantly-realised Tom All Alone’s by Lynn Shepherd, there have been some fabulous books out this year. However, there is one which I haven’t been able to get out of my head since reading it and which I had to choose as the best of 2012 – Tell the Wolves I’m Home. Set in the mid-1980s, Carol Rifka Brunt’s novel is a hauntingly gorgeous debut. When June’s uncle and best friend, the renowned but reclusive painter Finn Weiss, dies of a mysterious disease, she is devastated. In the early days of AIDS awareness, the stigma attached to it means that no-one will talk to June about Finn, and she cannot reveal why she is as upset as she is. When Finn’s partner Toby gets in touch with her and explains that he misses Finn as much as she does, she is prepared to hate him for occupying part of Finn’s heart that she had thought was all hers. As they get to know each other, she and Toby realise that Finn has been more cunning that they gave him credit for. What makes the novel so fabulous is the quality of the writing. There are paragraphs that I had to read several times because the writing is so gorgeous, and June’s narrative voice is pitch-perfect. Insecure, baffled by her sister’s distance and somewhat isolated from her schoolmates, she thinks that she has hidden her greatest shame, her love for Finn, from everyone, not realising how obvious it was to those who mattered. She is self-aware enough to admit that there are less than altruistic motives to some of her actions, but at other times her naïvety is immensely touching. She is brave and imperfect and is my favourite ‘heroine’ since Cassandra Mortmain. This book is about so much more than I have written but I wanted to hold things back so people will discover it properly for themselves. It’s a beautiful, hopeful and assured novel and I tear up every time I think about it. In a good way. Tell The Wolves I’m Home was published by Pan Macmillan in June 2012. This post has been written by blogger Kristina Wilde of Fictavia. Fictavia is a relatively new blog to me, but I always enjoy reading Kristina’s posts and she is rather charming on Twitter as well. Here she talks about her pick for the best of 2012, poetry collection The Glass Delusion by Abi Curtis. When Lizzi approached me on Twitter to write an article for this series, I knew immediately which book I wanted to write about. “Can I do poetry?” I asked hopefully. Think about this for a second. Do you read poetry, in general? Very few people seem to connect poetry to literature as a whole. Sometimes people instead think of epics like The Odyssey, or rustic yearning like that by Thomas Hardy. Some dismiss it as a maudlin cry for attention (even if, as in the case of Sylvia Plath, the writing style is meritorious). The fact is, poetry is still around. It’s evolved, though. Nowadays, good poetry isn’t about trying to write on the sweeping topics of love, death and war. It’s about honing in on the little things and finding a new angle, rearranging language. Think about poetry’s relationship to full-length fiction as photography’s to film: a poet today must communicate as much as possible with a small number words. Reading through Abi Curtis’s The Glass Delusion is like getting the ability to read particularly beautiful, strange photographs. As a poet in general, Curtis is very gifted. Her first collection, Unexpected Weather (2008) is gorgeous in its own right. The Glass Delusion, however, sees Curtis test her ability much further. The title itself comes from the hysterical notion that one has turned to glass and will break – http://en.wikipedia.org/wiki/Glass_delusion. It sets the tone for a collection that bursts with oddities and discovery. Her writing style combines arresting imagery with downright absurdity. That mix is very charming. When Curtis turns to a mini arc entitled ‘Mrs Beeton’s Book of House Management’, it is to explore the relationship between cooks and their charges: the food that will end up on the plate. The well-drawn grotesquery of “the slubber of [a calf’s] mouth” cannot fail to conjure imagery for the reader. And there’s pop culture, too. Just not how you might expect it. In my favourite poem of the collection,’Marrying Doctor Who’ looks at the stressful life as the wife of a man who is destined to change his appearance and personality. I think my favourite part is how Curtis never numbers the Doctors – so if you know nothing of the show, you needn’t be excluded. She communicates each nuance of his change with simplicity. If you are a fan, you’ll find yourself identifying traits of each regeneration – but then again, Curtis does not present him strictly chronologically, so you’ll find yourself mixing and matching the traits. And isn’t that the point of the Doctor? That sometimes, he’s exactly like one of his old selves? This is part of Curtis’s magic: she makes you rethink what you already know. But along the way, she teaches, too. The Glass Delusion is full of odd corners and tangents. Reading it is like walking through a hall of mirrors: you think you know what to expect, but the reflections that come up are charmingly skewed and occasionally a little disturbing. A total joy. The Glass Delusion was published by Salt in July 2012. This post has kindly been written by author and playwright Peggy Riley. 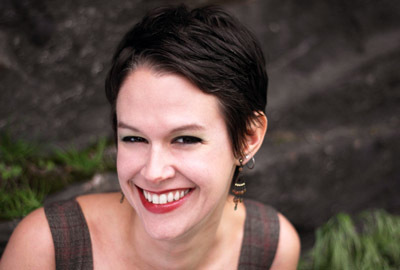 Peggy’s debut novel Amity and Sorrow will be published in March 2013 by Tinder Press, a new imprint of Headline. Here Peggy talks about her pick for 2012, Booker Prize winning Bring Up The Bodies by Hilary Mantel. My book of the year was Bring Up the Bodies. Wasn’t it yours? Hilary Mantel’s second of three books about Thomas Cromwell seemed to top every book list going, though she was pipped to the ‘Waterstones Book of the Year’ post by an octopus. My reading this year has mostly consisted of last year’s and next year’s books, but it is hard to find a book published this year that is more audacious. You don’t just read a book and a story this large, this grand, this all-consuming; you live with it and through it. The experience of reading it is near hallucinatory, with its great waves of words washing over and through you. It is a testament to Mantel’s skill that the middle book of a trilogy be so compelling, able to stand alone from Wolf Hall yet leading the reader to ache for the denouement that will come in the third, The Mirror and the Light, even though the ending is already fixed in time. I don’t know what I’ve learned of Henry and his wives and wars; I’m a Tudor-nerd and my sense of them has been created via a variety of media over the years. I’m not sure that Mantel has altered, adjusted or even added to my sense of them. What she has done is to bring a painting to life, this relatively unknown man captured by Holbein. Before reading, I had a vague sense of him, that he was somehow “bad”. Mantel has shown me a multi-faceted, fully-realised character who has become, for me, a real man, a living piece of history set within a fabulous story. My sense of Cromwell will forever be Mantel’s now. I can’t wait to see what comes next. Bring Up The Bodies was published by Fourth Estate in May 2012 and went on to win this year’s Man Booker Prize. This guest post has been written by blogger and philosophy PhD student Alan Bowden. Alan’s blog Words of Mercury is an intelligent and well-written book blog with a variety of texts as well as Alan’s own fiction and poetry. Here he talks about his favourite books of 2012 (he couldn’t choose just one! ), Rook by Jane Rusbridge, Hawthorn & Child by Keith Ridgway, Swimming Home by Deborah Levy and Object Lessons: The Paris Review Presents The Art of the Short Story. 2012 has been a significant year for me as I’m of the firm belief that it’s the first time I really started reading fiction. (I also got married). I’ve read hundreds of novels, but only once I began writing reviews for my blog did I realise what they can really do. As a result, many of the books I’ve read this year have a lasting personal significance beyond their purely literary achievements. The books that follow are as much a reflection of my new engagement with contemporary fiction as they are an attempt to pick some personal highlights of what has been, by all accounts, a very good year. A quick note on criteria: with one obvious exception all my choices were – to the best of my knowledge – published for the first time in 2012. Reprints, translations, new editions, and so on, were excluded. Some further criteria: The late Peter Goldie turned more than once in his writings on the philosophy of art to a quotation from his favourite author Joseph Conrad. He felt that it captured the essence and value of the project of creating and consuming art. The artist, Conrad wrote, ‘speaks to our capacity for delight and wonder, to the sense of mystery surrounding our lives; to our sense of pity, and beauty, and pain: to the latent feeling of fellowship with all creation—and to the subtle but invincible conviction of solidarity that knits together the loneliness of innumerable hearts; to the solidarity in dreams, in joy, in sorrow, in aspiration, in illusions, in hope, in fear, which binds men to each other, which binds together all humanity—the dead to the living and the living to the unborn.’ More than anything, the books which will stay with me from this year have looked to speak in this way. Jane Rusbridge’s wonderful Rook (Bloomsbury Circus) successfully seeks to occupy the slippery but persistent ground between the land and the sea, the past and the present, bereavement and consolation, in language that flows with the rhythms of the tides that inundate the Sussex village of Bosham and the insistence of the young rook rescued and nurtured by Nora, a former concert cellist forced to return to the home of her widowed mother by the crisis which haunts the novel. The interpenetration of the language of the mind and landscape in moments which shift toward the visionary before returning, quite literally, to earth, emphasises Rusbridge’s concerns, not only with the role of place in forming our mental economy, but also with the idea that the only way that we can reach out and touch the past is by staying where we are and living in the same buried spaces. A concern with the complexities of surface and depth underpins Booker shortlisted Swimming Home by Deborah Levy (And Other Stories/Faber). Gathered around a pool in the South of France are two quite different couples, childless shop-owners Laura and Mitchell, and war correspondent Isabel and poet Joe who are accompanied by their teenage daughter Nina. The pool’s surface is disturbed by the arrival of Kitty, a painfully thin young woman obsessed by Joe’s poetry. Her uneasy transition between surface and depth is mirrored and undermined by Levy’s refusal to allow clear distinctions between private thought and public behaviour. Levy clouds motivations and relationships as the transparent pool water becomes cloudy through mismanagement and inattention. With a Cubist fondness for allusion, her faceted prose creates a fluid space of shifting desires, dreams, and repressed violence. From fractured minds to broken narratives of urban lives, the much tweeted and quite stunning Hawthorn and Child by Keith Ridgway (Granta) sticks a policeman’s boot into the novel and emerges bloody and triumphant between the splints of its covers. A set of eight stories set in North London and loosely held together by the detectives of its title, this book challenges any and all coherence you felt your identity and experience might have. It’s a novel of violence and sickness of language; of fear, memory, suspicion, lust, and confusion. And it’s marvellous. ‘I am cracked like ice. I know this. But listen. Listen to me. This is important. Beneath the fault there is solid ground. Beneath the ice. Under all the cracks. Under all the cracks there is something that is not broken.’ But is there? The mind’s resilience beneath the weight of solitude and the meaning of human endeavour are at the heart of James Smythe’s unforgiving novel The Explorer (Harper Voyager) in which journalist Cormac Easton finds himself the lone survivor on a mission to deep space. Then it gets weird. Smythe’s writing is controlled to within an inch of its life and Cormac’s direct first-person voice, which begins as a journalist’s selfish mythologisation of endurance, becomes as tender as a bruise as its pretention is stripped away by shock after psychological shock. What is it to explore with no hope of remembrance? How does one understand oneself when stripped of the gaze of others? The bizarre reflexivity Cormac achieves is testament to Smythe’s narrative and poetic imagination and ambition in his consideration of exploration, time, and identity. Finally, Object Lessons: The Paris Review Presents the Art of the Short Story (William Heinemann) contains a superb collection of stories. Each has been selected and introduced by another excellent writer, some of whom appear as both a selector and a selectee. Thus Jeffrey Eugenides introduces Denis Johnson’s remarkable ‘Car Crash While Hitchhiking’ which, he argues, ‘delivers a narrative where the personal brushes up against the eternal, all from a single incident, or accident, on a rainy night.’ Lydia Davis selects and dissects Jane Bowles’ ‘Emmy Moore’s Journal’, revealing its hidden and confused despair, whilst her own ‘Ten Stories from Flaubert’ appears as Ali Smith’s choice. I must confess that I haven’t finished this book yet: I refuse to rush it. Each story must be read and then returned to once the introduction has been taken in. As a guide and inspiration for the budding short story writer Object Lessons cannot fail. Rook was published in August 2012 by Bloomsbury Circus, an imprint of Bloomsbury UK. Swimming Home was published in October 2011 by And Other Stories/Faber. Hawthorn & Child was published in July 2012 by Granta Books. The Explorer will be published in January 2013 by Harper Voyager, an imprint of Harper Collins. Object Lessons: The Paris Review Presents The Art of the Short Story was published in October 2012 by William Heinemann, an imprint of the Random House Group. This post is written by blogger Lucy Rock. Her blog, Literary Relish, features a pleasingly varied selection of books, as well as updates about The Manchester Book Club, which Lucy attends, and which has its own blog here. I always enjoy Lucy’s writing and she was an obvious choice to contribute to this series. Here she talks about her pick for Best of 2012, The Snow Child by Eowyn Ivey. Eowyn Ivey (i.e. Tolkien’s Éowyn – a deliciously bookish namesake) is lucky enough to live in the remote, and rather huge, American state of Alaska. 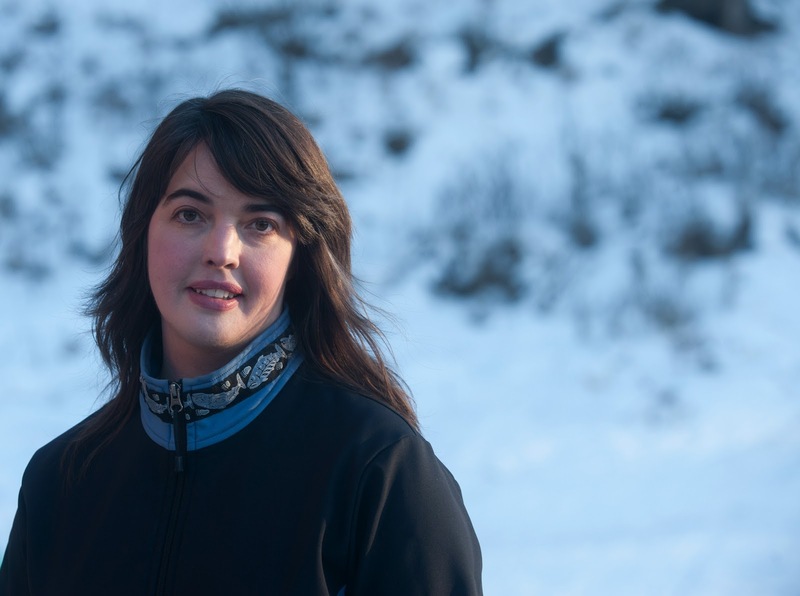 In The Snow Child she has drawn heavily on the region’s intense beauty and severity to provide the otherworldly backdrop to the lives of grief-laden couple Jack and Mabel. After losing their only child at birth ten years before, the pair have never been able to have a baby of their very own, something they have desperately hoped and prayed for and an absence that has caused them to become isolated from both each other and now, quite literally, the rest of the world. Moving to Alaska to find the space and simplicity they need to move on with their lives, the couple find nothing but poverty, darkness and separation. One night, in a rare moment of innocence and levity, the pair fashion a delicate little girl out of the snow in their front yard, complete with scarf and red mittens. In the morning she is gone, a single track of human footprints leading away from the melted figure and into the line of trees. A short while after, a beautiful, wild little girl enters their lives. Dressed in scarf and red mittens with fine delicate features and twigs in her white-blond hair, she is the child they have always hoped for, stepped right out of the wilderness… or… out of a fairytale itself? This is a beautiful book on every level. Although the lead up to Christmas is clearly the perfect time for snow, magic and wishes, Eowyn Ivey still gives the book depth, trekking far across the Alaskan wilderness; a dank, dark, depressing frontier, and continuing all the way through to a place where Jack and Mabel can afford to hope and dream. Our snow maiden remains the focus of life in Alaska and the single delicious mystery that extends through and remains a long time after the book has been closed. 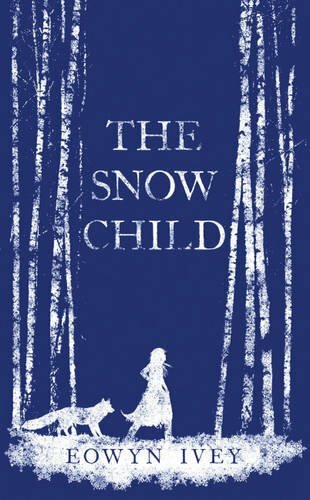 However, what helps The Snow Child reaches far beyond the realms of simple fairy tale and nursery rhyme is the anchor of Jack and Mabel and the very real community that surrounds them. Although sympathetic about her circumstances, I found myself becoming extremely frustrated with Mabel and her reluctance both to meet her neighbours and throw herself into her new life – in a bit of a ‘come on love!’ manner. Instead, she initially appears surly and squeamish, in sharp contrast to her companion Esther. With Jack’s honest and hardworking nature, Garret’s surly and initially untrustworthy manner and a plethora of other minor salt-of-the-earth style characters, this becomes a family drama that extends far beyond the snow drift. The life of self-sufficiency that Ivey and her family lead in Alaska is admirable. Hunting for meat, growing their own veg and raising chickens, it really does seem the rural idyll. Her familiarity with and love for this savage state permeates this novel with a sense of place rarely discovered. My partner and I have always dreamt of visiting Alaska, The Snow Child is the perfect travel companion. The Snow Child was published on 30 August 2012 by Headline. This post has been very kindly written by the author Emma Chapman. 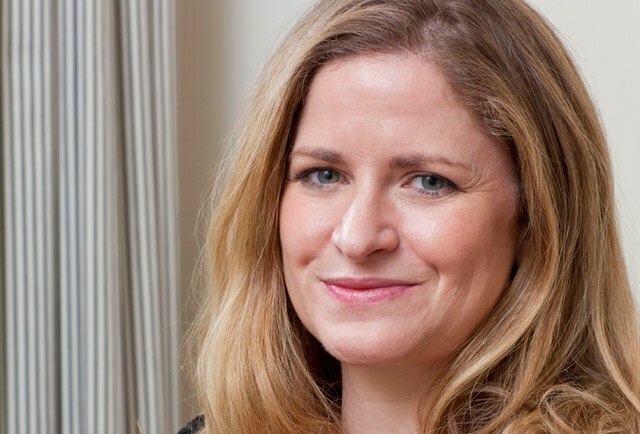 Emma’s debut novel, How To Be A Good Wife, is a tense psychological thriller that will be published on 3rd January 2013 by Picador, an imprint of Pan Macmillan. Click here to see my review. Here Emma talks about her favourite book of 2012, Tigers in Red Weather by Liza Klaussmann, which just happens to be on of my picks for 2012 as well! When These Little Words asked me to contribute to the ‘Best of 2012’ blog series, I was excited. An easy and enjoyable task, I thought, seeing as I spend so much time reading. As I began to ponder the brief, only one book really stood out as the life-changing kind that would be remembered forever, a book with the rare quality of making me want to be a better writer. Tigers in Red Weather was written by a friend, and I was thrown into turmoil, wondering if bias was clouding my judgment. Liza Klaussmann and I studied in the same eight-person masters group at Royal Holloway, and we are all still close, meeting over cocktails to discuss work in progress and myriad other things. I saw Liza’s novel, which was subject to an eight-publisher auction in August 2011, when it was in its very early stages. Of course, when I read it as a finished book, there were bound to be some feelings of nostalgia and friendship mixed in with my critical eye: perhaps it wasn’t the right book to choose for this feature. But, whenever I went back to the title, ‘Best of 2012’, it was without a doubt the best I had read. When I tried to replace it with other titles, it didn’t feel fair. I wasn’t the only one with this opinion: the journalistic, blogger, and Amazon reviews have all been outstanding. The book has just won the Elle Best Book for 2012, and is down to a shortlist of three for the Amazon Rising Stars 2012. During the Masters and our first nerve-wracking few meetings, showing our fiction to others for the first time, Liza’s stood out. There was a phrase she used in a short story which invoked frissons of awe and jealousy, and which I still remember word for word. A party on the island where Tigers in Red Weather is set is described as “all of it big; all of it worked over; all of it crazy salad”. I’ve chosen to celebrate Liza’s wonderful book, not because she is my friend, but because she is a brilliant writer who has achieved something spectacular. Tigers in Red Weather explores the idea of the family as a coherent unit, challenging our notion of collective memory of events and whether we ever know the people closest to us. Through the multiple narratives, told over a time-span of twenty years, Klaussmann is able to show us the parts and let us piece together the whole: a most satisfying and frustrating experience. Like the characters, we are left wanting by our own inabilities to see outside of our viewpoint of the story being told. She was an interesting person, but she had cracks. And it was the cracks I was drawn to because they were the inside peeking out, a glimpse of what was hiding below the surface. The back fat spilling over the dress; the chewed cuticle; the smudged lipstick; the run in the stocking. Although it pains me to identify with the psychopathic Ed, these are the things I am interested in too: the reasons I am a writer. Klaussmann shows us the underside of the characters, brilliantly revealing how they see themselves, how they are seen, and they want to be simultaneously. She keeps us at arms length, which means we can observe the goings on with a crushing inevitability: each character stumbling blindly towards their fate. 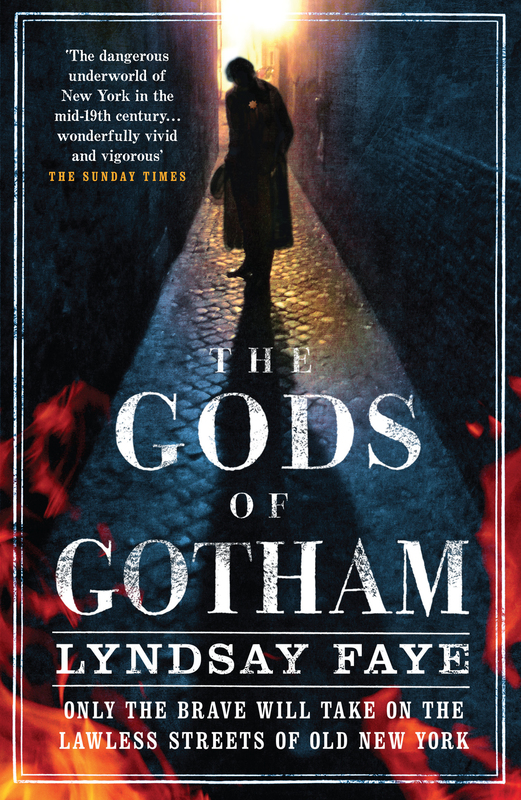 Many of the Amazon reviews of the book have bemoaned that they never felt ‘close enough to the characters to care what happened to them’, but I think that is the power of the book: as in real life, we cannot get close enough to change anything. There are so many other wonderful things to say about this book. The language used is exquisite, careful rendered, without being over-wrought. The setting is beautifully drawn, so languid and glamorous, that the darkness revealed is all the more poignant. Klaussmann makes us long to live like these characters who seem to have everything, while at the same time showing us the tragedy of their existences. Tigers in Red Weather is a book that deserves to be celebrated and demands to be read. And although Liza doesn’t need my endorsement of it, it is simply the best book I read in 2012, and I couldn’t have given the accolade to any other book. 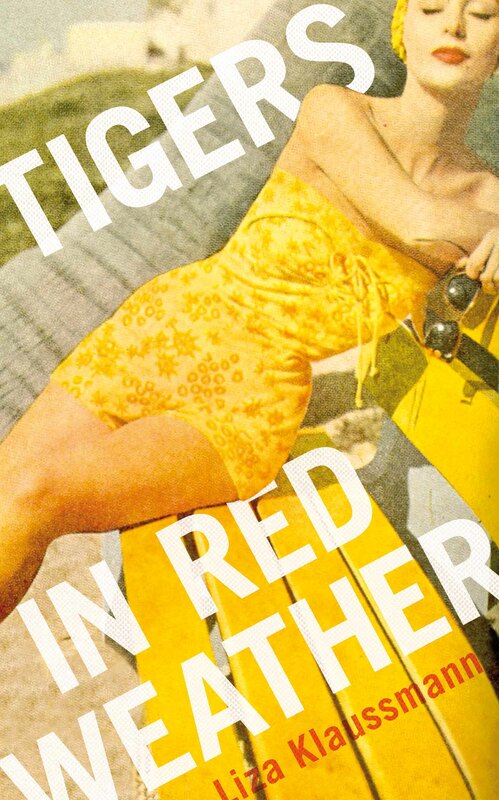 Tigers in Red Weather was published on 2nd August 2012 by Picador. Click here to see my original review, and here to see my interview with Liza. Lyndsay Wheble is a blogger I’ve been reading for a while, and I’m always impressed by her choices of books to feature on her blog, Tolstoy Is My Cat. She is a dedicated reader and her blog is a joy to read. Here she talks about her pick for 2012, The Sisters Brothers by Patrick De Witt. When Lizzi asked me to contribute to her ‘Best of 2012’ list I really had to think about it as I actually tend to shy away from reading books that are too new: I’d rather delve into a backlist or pick up a book that has survived the baptism of time, rather than being seduced by flash-in-the-pan hype or the most impactful marketing budget. In fact, I have a confession to make: it turns out, upon checking my Goodreads ‘read’ list, that I’ve only read two books published in 2012 and neither was good enough to warrant being on this list, so I’m going to bend the rules slightly and talk about a book published in the second half of 2011 and featured on the 2012 series of the More4 TV Book Club, which is how it came to me. Apologies to all for my shunning of modern fiction; rest assured, I am heartily slapping my own wrist. So, all awkwardness passed, The Sisters Brothers by Patrick DeWitt is my choice for my ‘Best of 2012’; I made an exception to my old-books-first rule for it because of its stunning cover, Granta credentials and the fact that the More4 TV Book Club literally put it into my hands, and I’m so glad I did. This book is a humdinger of a novel that will stand the test of time, there’s not a doubt in my mind. The premise is at once familiar and deeply unusual. Set in the 1850s Californian Gold Rush, brothers and hitmen-for-hire Eli and Charlie Sisters are contracted by the Commodore, an omnipotent, malevolent figure, to track down notorious prospector Hermann Kermit Warm (what a name!) for reasons initially unknown to them. Along their Don Quixote-esque way to finding this man, they come across a whole host of characters – some sympathetic, some downright bloodthirsty and disgusting, but all horribly memorable – and we learn that Eli, the younger brother and our narrator, is increasingly sickened by his lifestyle and occupation, and yearns for an honest living, a smaller waistline, and a better man’s peace of mind. The humour of this book is as black as tar, the realism incredibly modern, but the vernacular and historical setting are rendered to perfection. It is also incredibly surreal, with a modern emotional honesty and a pure literary class, which made me feel that if the Coen Brothers were to make a surreal, literary, dark-as-pitch Western, it would be something like this. The language is poetic and visual, the plot is really a vehicle for Eli’s fascinating self-discovery, and DeWitt is not afraid to explore a tangent or to make the absolute most of every single funny, distressing scene. ‘What happened to you?’ I asked. ‘He led himself to water, is what he did,’ said Charlie. ‘Which way did these men go?’ I asked the boy. Now, six months after reading it and posting my original review, just to think of this book is to have my mind populated with rotting horses, mysterious, mangled old crones, the wonders of teeth-cleaning, horrors in the river and Californian saloon bars of the highest, most vivid order. I think this was my first ever literary Western, but if they were all like this, I’d read them all. 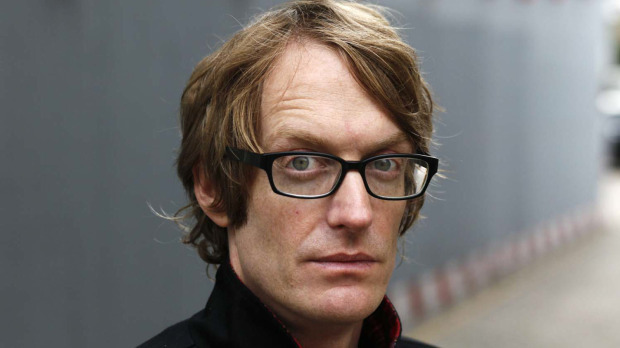 Bravo Patrick DeWitt, and a whole-hearted recommendation that you give this book a try. 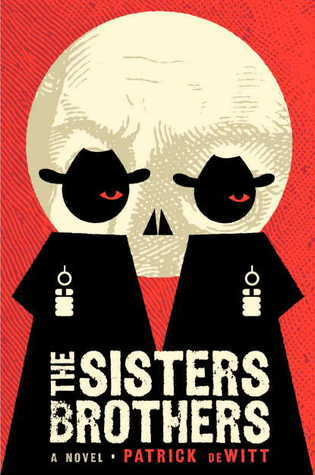 The Sisters Brothers was published in paperback in October 2011 by Granta Books.